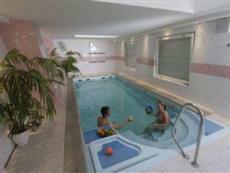 The Jessenius Hotel Karlovy Vary is situated near the city’s center. Located on the town’s main thoroughfare, this hotel is proximate to many of the attractions that draw people to this resort community including the various spas, restaurants and shops that populate the center of the city. From the Jessenius Hotel Karlovy Vary, it is an approximately two-hour drive to the capital city of Prague. The Jessenius Hotel Karlovy Vary allows its guests to make orders from room service around-the-clock. The hotel also welcomes pets. Within the rooms, guests are provided with television and other modern amenities. Non-smoking rooms are available. The Jessenius Hotel Karlovy Vary has its own doctor on staff who, using a previous examination, can recommend various therapies offered by the hotel. The hotel also offers a bar where guests can mingle and enjoy a drink together. There is a restaurant located on the premises which serves international fare and which offers diners a chance to eat on the terrace during the summer months.